How to produce the LCD? 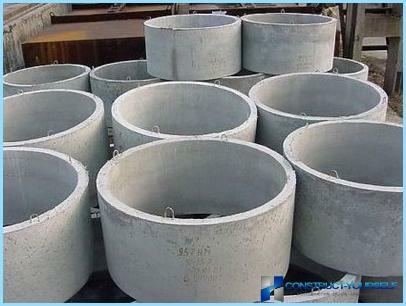 Concrete rings are widely used inall areas of construction. Most often they are used to build wells and septic tanks. These products have a high strength, frost resistance and fire resistance. Therefore, they are used in such complex structures like natural gas pipelines network. 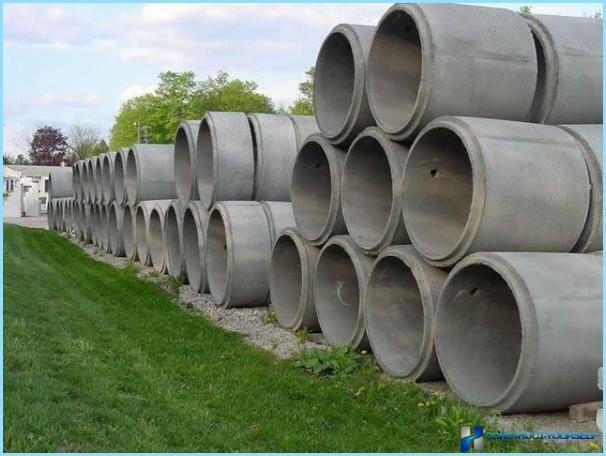 Concrete rings used in the creation ofdrainage systems. The main purpose of construction of the well is to reduce the level of groundwater. Reinforcement is used to enhance the design, can effectively resist stretching. Concrete, in turn, assumes the entire load of the compression. 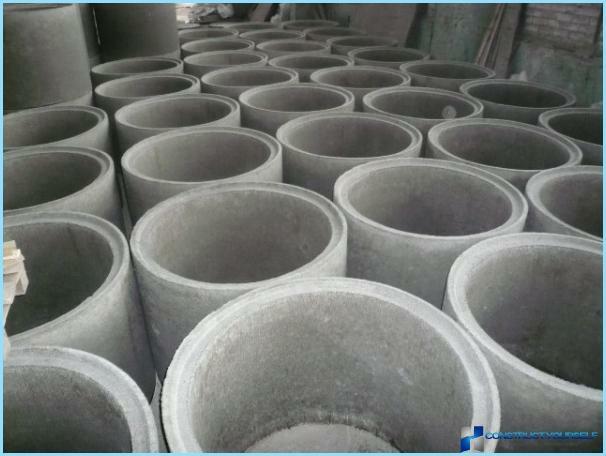 In the production of concrete ringsused different varieties of fittings and cement. In most cases, this form of ribbed round bars in section. Concrete, in this case serves also a protective function, preventing corrosion of the metal to corrode. LCD is not used in the construction of undergroundhorizontal piping. This is associated with these systems impractical. Low leak leads to leaks and appropriateness of the data elements disappears. There are also special modifications,intended to narrow the scope of use. Diameter of products ranges from seventy to two hundred millimeters. The average height of about fifty centimeters. The highest-concrete rings can reach two meters. Important! Each reinforced concrete ring should be marked composed and alphanumeric symbols. 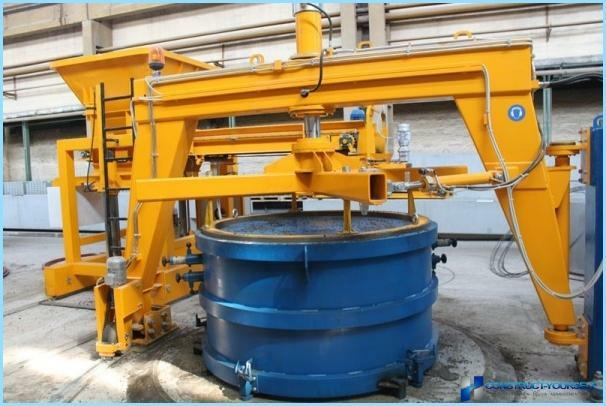 Sometimes in the process of testing someFerro-concrete rings specifically destroyed in order to determine the limit load factor. Modern technologies allow to avoid it. The ultrasonic method makes it possible to check the concrete compression option without catastrophic consequences. Preparation of concrete mix. To do this, use the M400 brand cement. It provides excellent adhesion and high strength. To increase the plasticity of a mixture design special plasticizers are added. Rubble added to the mixture should be no larger fraction of 20 mm. Of course, not be able to do without the sand and water. 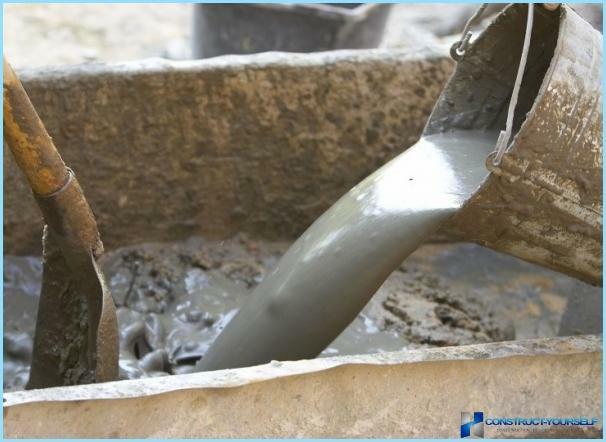 The concrete mixture is stirred in a mixer to the desired condition. Concrete is poured into the mold. This reinforcement is placed there in advance. At the end in the form of filling inserted strapping pustoobrazovateli. With vibropress passes compaction and consolidation. 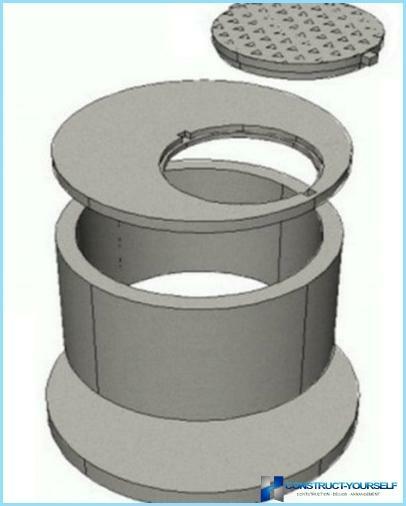 Swivel bar overwrites the top of the reinforced concrete rings. At the end of the outer casing is set. This is done on level ground. curing period about seven days. Of course - to buy reinforced concrete ringsplant easier. But once there is a question of delivery. LCD - a large product, delivery of which requires special transport. The absence of a normal road to the site of construction work often puts an end to the possibility of a well built. But there is a solution. Concrete ring can be made with your own hands. Of course, it will take a lot of time and requires some skill, but to repeat the process at home really. In addition, if you have all the necessary materials, such a decision would save a lot of money. First you must decide what you need-concrete rings. Take a piece of paper and draw a future construction. Enter the height, thickness and diameter. Important! Minimum thickness of the concrete ring should be at least 7 centimeters. You can buy ready-made or make the formworkher own. To do this you need two metal barrels, corresponding to the desired diameter of the concrete ring you. If the walls of the barrels have squeezed ribs - do not worry. They povalivayut on the performance of future products. If the farm is not the barrels, can be used to make the casing pipe or sheet metal. Plastic barrels are also an excellent choice for this task. On the lines set window or door awnings, which are fastened with rivets. It is also possible to use welding. On the extension of reinforced concrete ring is created by the projection of the outside line. With grinders inside the cylinder is cut along the lines of markup. This cutting disc must be the most subtle of all. On one side are cut with canopies caps-locks. On the inner side of the two cylinders are appliedhorizontal lines. The distance between them should be 1/3 the length of the circumference of the casing. As a result, one part will turn out more than the other about two times. On the inside, where there are markings, installed canopies. Creates internal projection marking lines on the outer side. The cylinder is cut along the lines previously suffered. When assembled, the inner cylinder shouldrise above the external 5-10 cm. The outer form must be easily opened and closed. When reinforced concrete ring is released primarily removed inner form. Cleaned spindles, and the cylinder is drawn out of the fresh concrete rings. Preparation of the desired cement solutionconsistency. The ratio of cement to sand 1/3. Also, do not forget to add in a mixture of gravel fraction not exceeding 20 mm. It should not be much, somewhere one in five of the total weight. Decking is installed on a level floor. The pallet must be metal or wood. Between the inner and outer cylinder is laid reinforcing mesh. The wire can be used as an alternative to conventional. It keeps the turns together with the addition of concrete. For cylinders not shifted during laying of concrete mix, set restrictive wooden wedges. Solution is placed around the entire circumference at the height of about 20 centimeters. 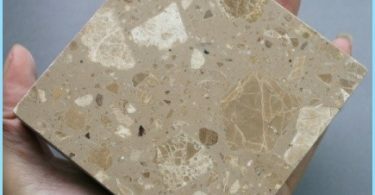 Compacted mixture with a metal pin. Fit one more layer of concrete. Wedges are removed when the level rises above the sweep average. After the concrete is laid, top leveled. Formwork is removed after 4 days. To achieve the desired design strength necessary for 7 days. During this period, you need to make sure that the concrete does not dry up. 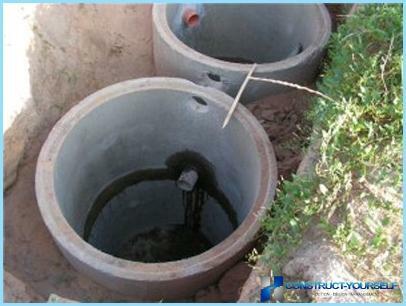 Most often when installing drinking water wells used reinforced concrete ring with a lock. They are tightly adjacent to each other, and hence the possibility of leakage is reduced virtually to zero. An important role in the construction of the well regainscushion and support - a kind of foundation, not giving the building to sink. Castle on the rings allows effortlessly set the last frame reinforced concrete structure for the bypass water. Important! Concrete rings for the well must have a waxy film. This will keep the water in the well all of its original properties. 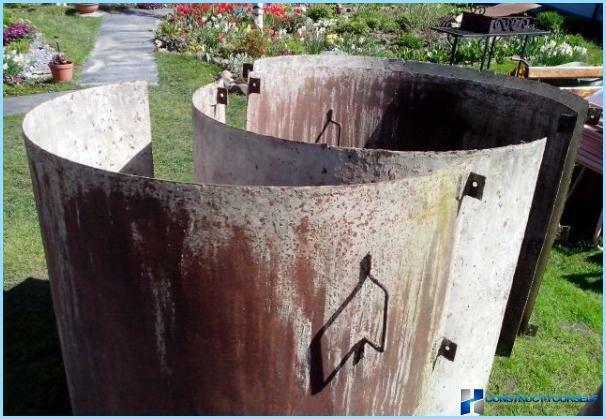 Because of their practicality and durability, as well asrelatively low prices of ferro-concrete rings are often used in the creation of sewage in suburban homes. The process is not very complicated, so having the basic skills of the builder, everyone can cope with the construction of a septic tank in his yard. With interlocks. At the top of the reinforced concrete ring therespecial projection and the bottom recess. In the process of mounting the ring is placed on one another, thus creating a strong design. During operation, the design is not shifted. Concrete rings are always in the position in which were installed. Direct ring. These products when installing additional fixed with special clamps and cement mortar. Filtration rings. The structures are openings for uniform distance from each other. As a result of water seeping into the soil. These products are used in the creation of seepage of sewage wells. Important! 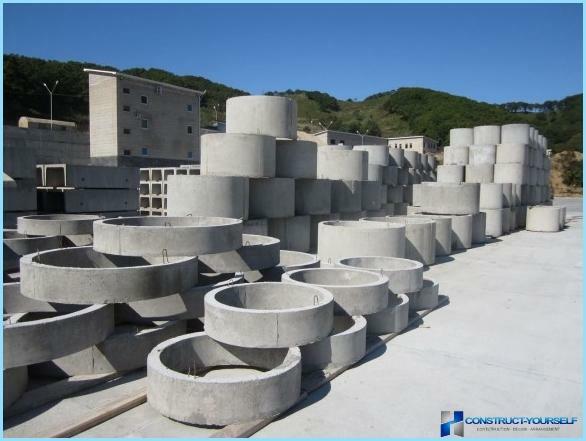 We have described above only large reinforced concrete ring forming the basis of the design. Nevertheless, additional elements are used during operation. During installation situations often occur,when you want to adjust the volume of the structure. To narrow the internal space using the adjusting ring of reinforced concrete. These walls have a large width and narrowed in diameter. Adjusting the height of the manholedobornyh going through rings. They allow you to complete the well, without violating the norms of building codes and state standards. This is especially true when the surface of the earth is still too small, and the ordinary reinforced concrete ring is too large. Important! From precipitation cesspit protected by overlapping and special hatch. Concrete ring at least 25 years are used in this construction. In some cases, the lifetime reaches 50-75 years. 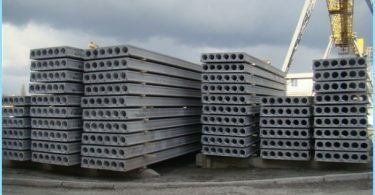 A lot depends on the quality of concrete and rebar, which is used to create the product. Concrete ring can be mounted inalkaline and acidic environment. They did not affect the formation of sludge and sewage fermentation. Better material than the LCD to create a septic tank is not found. Despite the emergence of new technologies andmaterials, reinforced concrete ring is still relevant. They are used to create wells, or different types of external networks and gas pipelines. They are easy to manufacture and have a long life.